So you think you're a pretty mean air hockey player, do you? 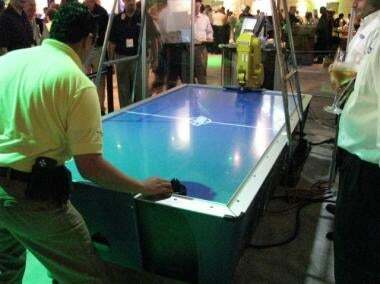 Well, are you good enough to take on a robot programmed to do nothing but destroy you in air hockey? When you take into consideration that this robot won't get drunk and sloppy and won't trash talk, it starts to look better than you on a number of levels. It might be best to just stick to human opponents, just for your dignity's sake. Hit the jump for a worrisome video of the robot coldly taking on a feeble, fleshy opponent.